This Christmas we decided to pack up the van and head for the mountains since Bryan was making the trip for the holidays we might get to spend some time and play in the snow. The Thursday before Christmas Bryan and his girlfriend Alek flew in from Louisiana and after a few days around the town and relaxing around the house, we departed on our Christmas cabin trip on Wednesday (12/23/09) morning for the western mountain region of North Carolina, specifically Creston, NC. We rented the Paradise Pointe cabin for five days and four nights, located on a high ridge looking over the valley with snow all around, and it was quite a treat and an adventure too. In fact, each day was filled with a new, unexpected, and unusual exploit. As we drive west from Wake Forest early Wednesday morning, we noticed that the previous weeks snowfall still had accumulation just west of Durham and continued to build the further we continued along the road. Piles of the powdery white stuff got bigger and abandoned vehicles were still strewn about parts of I-40 and US 421. We arrived at Boone, NC around noon, and just in time for lunch, but first we stopped at the Mast General Store on West King Street to get some gloves that Bryan and Alek needed for the planned snow activities. After finding some nice deals on warm socks too and a new carabineer for my key ring, we found the Boone Drug Fountain and Grill across the street and it had a lunch counter and had a wonderful lunch in an old time setting. Once we sat down were pleasantly surprised to find this little gem. It has an old diner feel with counter service and tables, set next to the drug store and pharmacy. The menu is about what you would expect from a diner/grill, plenty of sandwiches, burgers, salads, and even a selection of daily menu specials too. The menu items are reasonably priced, for five of us our lunch total was $40.00 + tip, and this included a few desserts and a chocolate malted too. The service was friendly and casual, but worth the trip for anyone who would like to enjoy a blast from the past. Monique had the BLT and it was as good as any you can get, Ben, Alek, and I had the cheeseburger with fries, mine was great, and Ben reported the same, with finishing his way before I could mine. Bryan got the daily special of fried chicken strips with cream gravy, curly fried potatoes, and cornbread. Monique had the three layer yellow cake with chocolate icing and it was moist and flaky besides being quite tasty too. It is a little after two o’clock in the afternoon, and we start back out on the road for the cabin, about a 25-minute drive from Boone, and we finally arrive around 2:45 surrounded by snow. 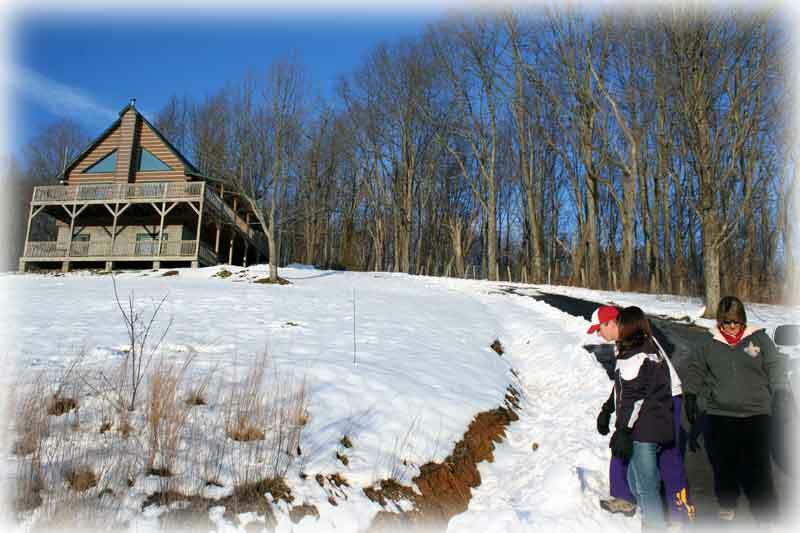 The last 250 feet or so of the driveway to the cabin was still partially covered with snow and after several failed attempts at driving up the steep snow covered slope, we decided to carry and hike our bags up to the cabin. At one point of entering the cabin, we thought we had locked ourselves out with the key on the dinner table, but the doors stayed open when shut so another mishap diverted. This was our first unplanned feat. After settling into the cabin, I started up a batch of pizza dough by hand and got it proofing in the oven, then we took to the outdoors for our first snow fun, walking, sliding, and making snow angels while we watched the sun set behind the frosted mountains. I will submit a separate pizza recipe posting as the first part of my segment with this week of planned contributions to the CCR blog. Oh, and just one more tid bit if adventure, Bryan saw a small mouse run over the kitchen counter and then behind the refrigerator just before bedtime. We moved all the foodstuffs from the counter and into all the cabinets for good measure after the little rodent sighting. The Dish Network satellite television would only pick up all the infomercial channels and a few “free” channels, such as NFL Network and Hallmark Channel. While we did not go to the cabin to watch television, it would have been nice to put on the Weather Channel or local news for updates on the impending weather conditions. After a breakfast of croissants and an Italian sausage egg scramble I decided the next order of business would be to find a way to get the van up the top of the driveway. With the van located 250 feet below the cabin I decided to take it upon myself to find some way to clear the driveway of snow and ice so we could park closer to the back door. After some scrounging around, I found some loose floorboards in the utility room, which ended up making for a very useful, albeit not as productive way of scooping ice and snow from the roadbed. It took the five of us about two and a half hours to clear the 250+ feet of 10% slope driveway Christmas Eve morning. Now, this might be nothing for all the northern folk who deal with snow for months out of the year, but for this green snowbird, it was quite the adventure and feat to shovel snow with makeshift shovels and such. I finally was able to drive the van up to the cabin before lunchtime. That was our adventure for day 2. We skipped lunch and played in the snow for several hours making use of the same floorboards as sleds and going down the one slope just across from the driveway and below the cabin. For dinner, I prepared the Shrimp and Grits recipe since both Bryan and Alek had never been treated to this Carolina specialty. No mice were sighted this day! Dish TV is still out, moreover, we called them and they were “working on it”, seems that the receiver lost its authorization, whatever that means. Christmas morning was Croissants again with some leftover bacon and then we opened a few presents that we brought along for the cabin. With no cell phone reception and limited texting, we were finally able to get family to contact us through the cabin’s land line phone later in the day. We did have Internet access and sent out several emails as well. 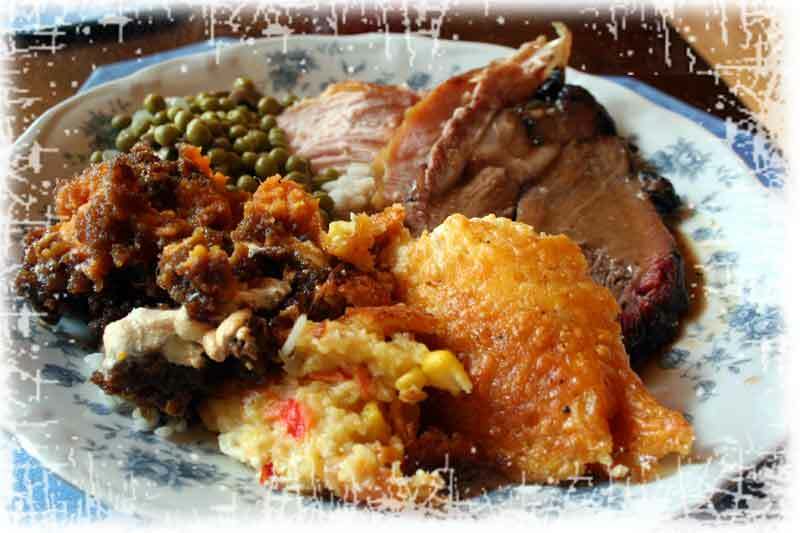 Nevertheless, after breakfast and the presents I took my shower and then proceeded to start up with the Christmas dinner preparations of heating up the smoked turkey, smoked leg of lamb, set up the corn casserole, rice, peas, and the bourbon sweet potatoes. I also started a lamb stock with the bone for making the gravy. 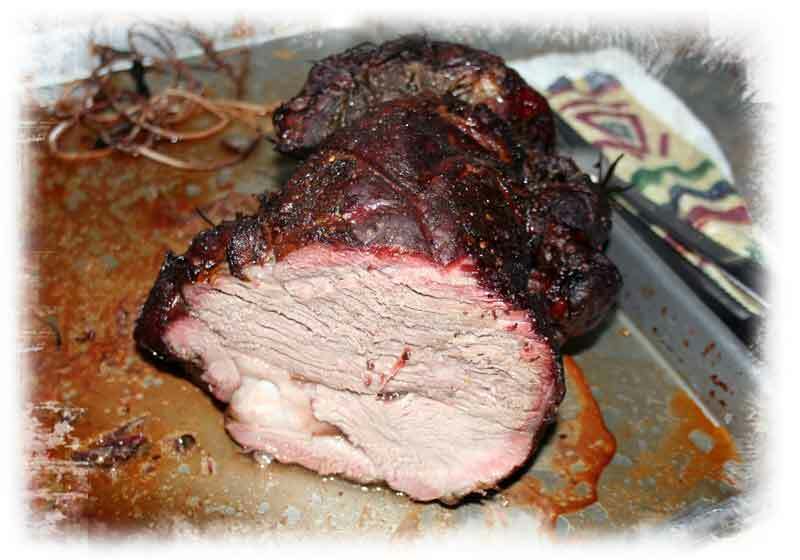 I will submit separate recipes for the smoked turkey, smoked leg of lamb, corn casserole and the bourbon sweet potatoes later on in the week on the CCR blog. . I did find a good recipe for Jell-O shots and proceeded to make several batches of these over the next few days. Monique made her key lime pie and a batch of rice crispy treats too. I will post recipes of the pie and Jell-O shots too. Once everything was ready, I started carving the turkey around a quarter after noon, and just about had everything ready when the electricity cut out. Luckily, everything was done with the cooking and the cabin has many windows to let in the sun light so Christmas dinner went off as well as could be expected. We found out later that an ice storm had passed through western North Carolina and cut power to 25,000 customers. In addition, luckily for us the power was restored about five and half hours later, just as the sun had started setting behind the horizon. Another day with a new adverse adventure! The mouse was sighted again, this time on the lower level of the cabin near the utility room. He ran under the water heater and disappeared again into the nether regions of the cabin. Still no Dish TV, but NFL Network still works. Early in the morning I heard rummaging coming from some bags in the bedroom closet, must have been our resident house mouse looking for tasty morsels. Leftovers were eaten for the remainder of our stay and I made another batch of Jell-O shots with Parrot Bay rum. We played in the snow for most of the day with our makeshift sleds, with about ten acres of country side to play in our own little winter wonderland it was a real treat to spend the day in the snow as a family. It was the most time we had ever spent in the snow, Monique was like a little girl, “…just one more time…I want to slide down the hill just one more time!” This was heard at least four times, however, it was a blast and we really had a great day. It is about seven o’clock and no major unusual events occurred….until we were packing up the kitchen for our departure the next day, when all of a sudden there is a knock on the front door. Turns out that the owner of the cabin told a friend of his that the cabin would be available and said they were scheduled to arrive on Saturday. We took in their eight children for about an hour or so as they worked on turning around their four vehicles and a trailer loaded with ATV four-wheelers and such and headed to another cabin. After speaking with the property manager, turns out they were supposed to arrive on Sunday. After about two hours of playing host to four families from Miami, we finally settled into watching a DVD movie. The mouse was sighted again in the lower level hallway, Dish TV has only infomercial channels now, seems the “free” deal ended. Monique screamed and we both jumped out of bed around 6:30 in the morning, the mouse had crawled up her arm and was staring up at her. We proceeded to pack up all our belongings and left the cabin within an hour without breakfast or coffee for that matter. After the unexpected guest visits the night before and our unexpected wake up call from our furry friend, we decided our adventures would have to end sooner than expected. Check out is normally eleven, but we figured hitting the road early was a better idea. Cracker Barrel for brunch and then we arrived home at one o’clock sharp. We finally got a good night sleep at home. wow what a great spread and the food is all making me salivate! 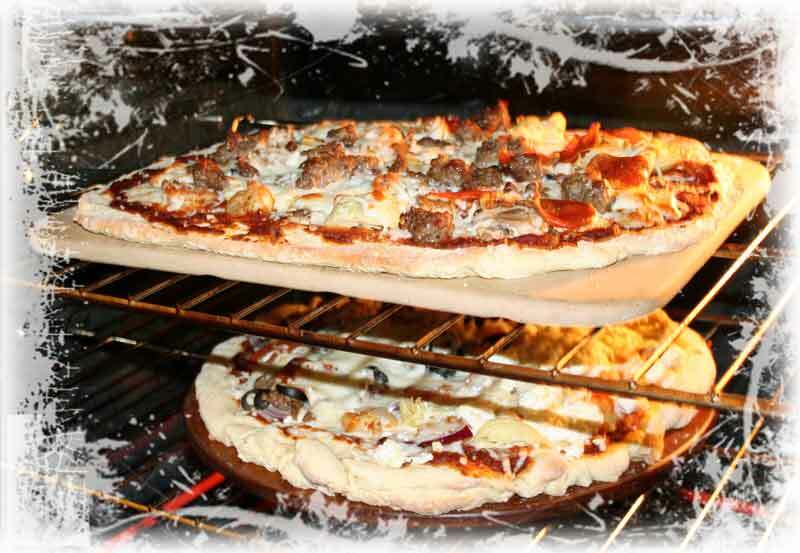 Especially that hand made pizza wow its gorgeous. I even love the chicken fingers with the gravy, I am so jealous over those jello shots, I love coconut rum which I usually mix with the lime and vodka, will try the rum that may be a match made in heaven wow this was a great get away christmas vacation….very nice! Have a great week and Happy New Year 2010! Awesome, that is the most perfect Christmas adventure and great food!! thanks for sharing this lovely christmas experience and all the food. What a fantastic holiday!! The food looks scrumptious!! But a great holiday in any ways 🙂 Hope there will be no mice!!! Ahh.. what a wonderful collection of food and family memories! Just as well no Weather Channel — they have no skill with predicting a chance of rodents! You know how to definately enjoy the good life…North Carolina is it…Thats where you will find me right now…I am just relaxing with family, making & eating good food..Got my fix of vension …delis…Have fun and following you has been awesome babe…Kiss the family MAUH!! You had me with the shrimp and grits.